The marketplace for domain names. Danielle Elderkin is the founder and the Chief Executive Officer of Cover Story Communications, Inc. With more than 15 years of experience, Danielle has some of the best contacts in the lifestyle industry. Several times a year she meets face-to-face with editors at the most prominent magazines in the country, including: Better Homes & Gardens, InStyle, The Knot, Every Day with Rachel Ray, Cooking with Paula Deen, Good Housekeeping, O, The Oprah Magazine, Redbook, Country Living, Ladies’ Home Journal, HomeWorld Business, Gifts & Decorative Accessories, and more. 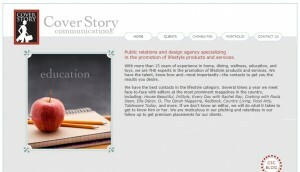 Cover Story Communications is a public relations agency specializing in the promotion of lifestyle products and services. MO: What inspired you to found Cover Story Communications? 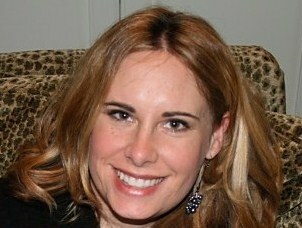 Danielle: Early in my career, I had worked at several public relations and advertising agencies. I was working tons of hours every week, traveling constantly, and giving everything to my career. When my husband and I decided we wanted to start having kids, it was the turning point for me. To have kids and be the kind of mom I wanted to be, I couldn’t keep up at this pace. One night, in the middle of the night, I came up with the name, “Cover Story Communications.” A few weeks later, I quit my job and set out to find my own clients. All it took was a computer, a phone and the determination and passion to make it happen. I still devote a lot of time to work, but it’s on my terms and on my schedule. MO: What is it like to work with your sister and have you always wanted to have a business together? Danielle: I absolutely love working with my sister. We talked every day even before I started the business, but now we have a constructive excuse to talk several times a day! We get very excited about our work and enjoy bouncing ideas off of each other. We’re both creative in different ways, so we make a good team. I think we always knew we would do something creatively together. In addition to working together at Cover Story, we also have several book ideas in the works. MO: How does it feel to be able to take your love of decorating, entertaining and cooking and translate that passion into a successful company? Danielle: It is really a dream come true for me. How many people are lucky enough to make a living talking about products that they love? Not to mention, we get to talk about these products to the editors who write and oversee my favorite magazines. Just last week, I visited Meredith Corporation in Des Moines, Iowa, with some of our clients. We met with editors from Better Homes & Gardens, Country Gardens, Traditional Home, and Midwest Living, to name a few. Then one of the editors was gracious enough to give us an exclusive behind the scenes tour of the BHG test kitchen (where the magic happens!) and photo and tv studios. I try to live in the moment when the business I started allows me to experience things I’ve dreamt about my whole life. MO: What are the contributing factors to your tremendous growth, despite the slump in the economy? Danielle: I never use the economy as an excuse. As I see it, one of the best times to hire a good publicist is when a company is experiencing declining sales. Positive publicity can increase sales in both the short term and long term. For instance, we recently secured a pretty significant hit for one of our clients on ABC World News with Diane Sawyer. Their web sales in the four hours that followed the segment set an all-time record for the company. Additionally, much of our business comes from word of mouth. Editors and clients frequently recommend our services to potential clients. MO: How have you managed to create a network of the best contacts in the lifestyle industry? Danielle: Editors know they can trust us and that we’ll jump through any hoops to get them what they need. It’s very much about relationship building too. We take the time to learn what content editors and producers are looking for and we always say “thank you” when they’ve put forth the time and effort to feature our clients. MO: What professional accomplishment are you most proud of so far? Danielle: The fact that Cover Story has been going strong for six years is an incredible accomplishment. Now that we’re growing and continuing to build our reputation in this industry, I look forward to seeing what happens in the next six years. I have an amazing team at Cover Story and very supportive family and friends who all make it possible.